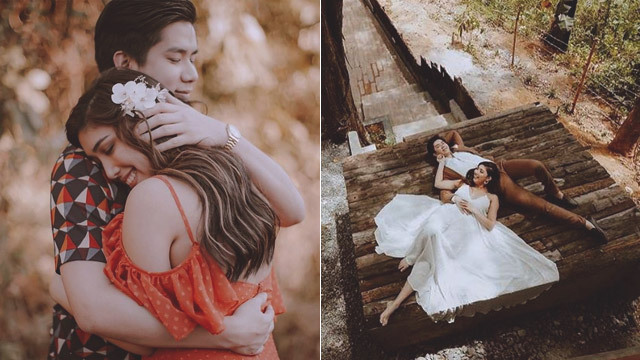 Alden Richards and Maine Mendoza's Kalyeserye characters have finished shooting their prenuptial photos for their upcoming wedding! AlDub fans saw the photos for the first time during the episode of Eat Bulaga! yesterday, October 18. After the airing, the Facebook page of the noontime show uploaded the pictures shot by Manny and April Photography. The first set of photos were shot in a bedroom while Alden and Maine wore all-white ensembles. The cute kulitan of Maine and Alden can also be seen in these photos... complete with yellow and white balloons! In one of their shots, Alden held a piece of paper asking 'Wala ng atrasan ah?' and Maine answered through another fan sign, 'Wala na talaga!' This is, of course, referring to their upcoming wedding! For the second set, Maine and Alden had an outdoor shoot wherein Alden wore a tucked-in polo and coat and Maine was in a light brown sleeveless blouse and cream skirt. Alden and Maine went formal for the third set of their photos wherein they dressed up like it's already their wedding day. The suit was designed by Paulo Lazaro while the gown was designed by Claiza Bihasa. John Lozano served as the stylist for this event. 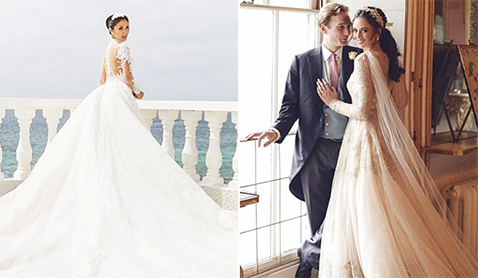 These photos allow you to imagine how Maine and Alden will look like on their wedding day! The last set of photos will remind AlDub fans about their Kalyeserye love story as it was set in the streets. Remember when Alden and Maine had isaw for their first date? There was also an episode when Maine as Yaya Dub had to hitch a ride on a jeepney (while wearing a gown!) when Alden ran after her just to see her. But in one of their prenup photos, Alden even carried Maine as they are about to ride a jeep! Of course, the prenup photos wouldn't be complete without Alden and Maine doing the famous "Pabebe Wave!" No announcement has been made yet as to when the characters of Alden and Maine in Kalyeserye will get married. But these photos just made it more exciting, right?